Captivating, mind-bending and addictive one trip and you’re hooked! Enter the challenging world of Rayman and sudden reality seems far too tame. Free your mind as Rayman takes you on an arduous adventure through the complex realm of psychedelic landscapes, absurd characters, formidable opponents, and uncharted levels of dementia. If there was one thing the Saturn and PlayStation could at least have something of a fair fight at, it was the 2D platform game. Thankfully, both systems got a great, if slightly dented game out of the original Rayman. First and foremost, this game still has, and always will have, some of the most beautifully drawn 2D animation in a console game. If you have a Component ready PStwo, by all means get this baby in there as soon as possible. Vibrant reds and oranges jump out at you as purples and lush green splash the landscape. Collected orbs sprinkle bits of sparkle as they’re collected, and characters animate like they were in a cartoon. The object in Rayman is to rescue these quite little things called Electoons and then go stomp on the end boss, all while acquiring new powers along the way. Action involves punching, platform jumping and ledge hanging, minor puzzle elements involving giant plums, and the occasional ride on a friendly mosquito. Don’t let the character designs fool you; Rayman isn’t a kid’s game. In fact, some levels can get down right frustrating. But these few areas give way to a more enjoyable, laid back game. You’ll get your money’s worth in trying to collect all the Electoons without using up all your Continues. In going to back to review this game for the site, I find myself falling in love with the game again. It’s by no means a play-for-hours-on-end kind of game, but in increments here and there, it’s a very fun, and sometimes skill testing ride. An astonishing 2D platformer in a time when certain Sony execs wanted nothing to do with 2D on the platform. Despite its difficulty spikes, Rayman 1 is a testament to the era, and worthy of owning. Launched just before the system did, making it the first 2D side scrolling game for the system. Rayman and his fellow characters have no linking body parts; they only have head, chest, hands, and feet. The ‘Notes’ section in the back of the manual is lovingly referred to as the ‘Deep Dark Secrets’ section. There are quite a few hidden animations in the game, including ones that involve the collectable mascots you rescue. To find all of the cages, sometimes you need to go around an area once, and when you come back, it’ll appear. 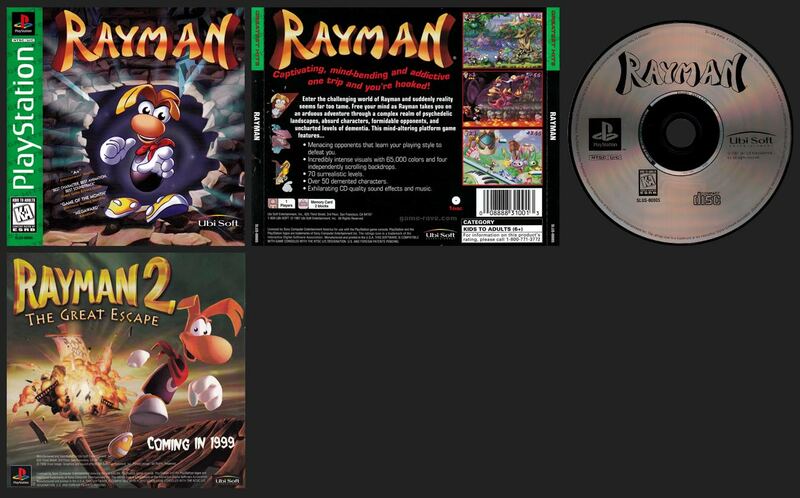 This version of Rayman is also available on the Saturn and Atari Jaguar. There was also a portable version available for the Game Boy Color.